In today's gospel, we have that mysterious conversation of Jesus and Nicodemus where Jesus says that the wind blows where it wants and where it comes from no one knows. The Hebrew word "ruah" means both wind and spirit, so Jesus is using a pun to get across his message. Then he says "If you do not know what I mean when I speak of earthly things how shall you understand when I speak of spiritual things." Jesus is referring to the mysteries of this world, the things that we can never understand; the real presence, what comes after death and so on. He also calls us to faith in him and says "I tell you solemnly, we speak only about what we know." Jesus knows about heaven, because he has been there, he can talk about the Spirit because he knows the Spirit intimately. And he expects us to believe simply because he says something is true. 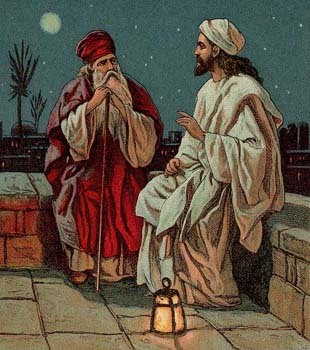 Poor old Nicodemus, when Jesus said that a person must be born again or born from above (depending on your translation), Nicodemus thought that he had to go back into the womb. That shows the difference between our human knowledge and the divine knowledge of Jesus. And the person who still sees the world in worldly ways can never understand the words of Jesus. They confuse them just as Nicodemus was confused!